Q. How do I log into a library subscription database from off campus? E. H. Butler Library provides access to multiple subscriptions databases from off campus. The following instructions will walk you through the best way to make sure you can access these subscriptions from off campus. 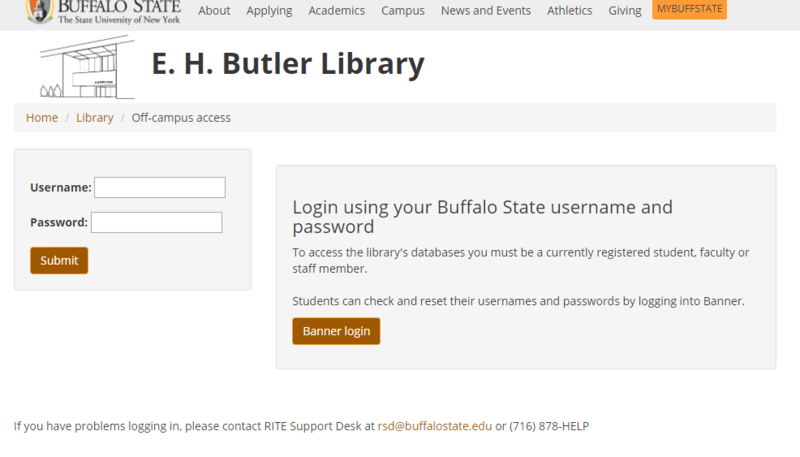 Off-campus access requires a Buffalo State username and password. Contact the IT Help Desk for more information. When you click on a database or full-text link, you should see the log-in page above. If it does not recognize the Buffalo State subscription, you may be redirected to a different login page that will not accept your Buffalo State user name and password. For all of your database subscriptions, it is recommended that you start at the library home page (http://library.buffalostate.edu). It is possible to get to our subscriptions from other web sites, but we cannot guarantee that it will pick up on your Buffalo State subscription. Citations and abstracts can often be found on the public web, but may not give you access to the full-text without going through the E. H. Butler Library site first. Often times it will ask you to pay for full-text access, even if Buffalo State has a subscription.